Norwegian Wood Retreat is a bed and breakfast and more! 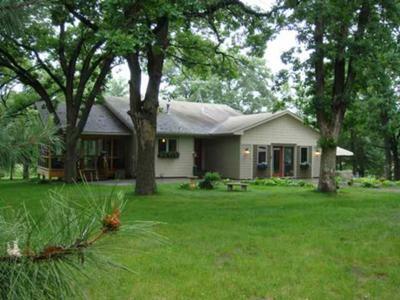 The fiber arts getaway is nestled in the midst of five wooded acres, just a convenient hour north of the Twin Cities, in Princeton, MN. The natural environment is a haven for kindred spirits. Enjoy wildlife simply by peering out the window. Share your retreat experience with a small intimate sized group. Perfect for up to seven overnight guests. Plan to spend a weekend unleashing your creativity without interruptions. The Cottage is the perfect place to enjoy knitting, scrap booking, quilting, stamping, beading, spiritual retreats, seminars, or just an all-girls weekend. Take classes, bring your current project, take advantage of the time to catch up on unfinished projects. Learning opportunities are also available with classes offered such as: knitting, circle celebrations, and cooking. Native nearby attractions include Prairie Restorations, Inc. and the Sherburne County National Wildlife Refuge. Weekend package includes six homemade meals using locally sourced, wholesome and organic ingredients. Arrival dinner, three meals daily, departure breakfast and afternoon tea are included in the package rate. All meals are served with an air of casual elegance. If you live nearby, we offer a "Day Rate" option. Our "Day Rate" option allows you to experience all the retreat's inclusions without lodging costs.